1. Vice presidential candidates come from the same party of the presidential nominee. That pattern has held since 1864, when Republican Abraham Lincoln and Democrat Andrew Johnson ran together on a National Union ticket; accordingly, it may seem too obvious to include. Yet frequently presidential candidates make somewhat serious, yet unsuccessful, efforts to attract a cross-party running mate. Hubert H. Humphrey’s (D) associates approached Nelson A. Rockefeller (R) in 1968, Richard M. Nixon considered replacing Vice President Spiro T. Agnew with Secretary of the Treasury John Connally in 1972, Bill Clinton’s campaign sounded out Colin Powell (R) in 1992, John Kerry (D) was interested in John McCain (R) in 2004, and in 2008 McCain actually vetted and was inclined to choose Joe Lieberman, a Democrat reelected in 2006 as an independent (and Al Gore’s running mate in 2000). The strategy is most likely when the party’s base is so hungry for victory that it will overlook ideological differences. Nonetheless, the increasing space between the parties makes such a strategy increasingly unlikely. As McCain concluded in 2008, why risk a choice that will transform the convention from a celebration of his leadership into an ideological circus? Nonetheless, it is a path some campaigns consider before ultimately following a less risky course. All but two running mates (Ferraro and Palin), have been white males. That pattern seems obsolete as women and minorities are increasingly playing leading roles in presidential politics and as more members of those demographic groups hold traditional feeder positions. One would now expect a male presidential candidate to consider picking a woman as his running mate and a white nominee to consider people of color. All but Lieberman have been Christians; seven (Miller, Edmund Muskie, Eagleton, Shriver, Ferraro, Joe Biden, and Ryan) have been Catholics. Religion seems less likely now to play much of a role in these decisions. Vice presidential candidates generally do not come from the most recent ranks of defeated presidential candidates. Since 1960, presidential candidates have chosen 22 first-time running mates. Only four (Lyndon Johnson, George H.W. Bush, John Edwards, and Joe Biden) had contested a primary or caucus that year. All but Biden had essentially been the runner-up for the nomination. Although some other unsuccessful presidential candidates have received serious consideration from the presidential nominee — Humphrey and Muskie in 1972; Frank Church in 1976; Gore in 1988; Richard Gephardt in 1988 and 2004; Bob Dole and Kemp in 1988; Hillary Clinton in 2008; and Romney in 2008 — most do not. An unsuccessful presidential candidate from a prior cycle provides another source of running mates. They might appear a plausible running mate yet have avoided the conflict with the current year’s nominee that often poisons the well. Yet first-time vice presidential candidates relatively rarely have been unsuccessful presidential candidates in prior years. Since 1960, that group would include only Humphrey, Lloyd Bentsen, Gore, Kemp, and Biden. After accounting for the same year and prior year unsuccessful presidential candidates, 13 of the 22 running mates since 1960 had not previously competed in a presidential primary or caucus. Of these, Mondale, Cheney, and Ryan had explored a presidential candidacy, or been widely mentioned as an attractive candidate, in the year chosen (Mondale and Ryan) or previously (Cheney). Accordingly, 10 of the 22 running mates had not previously figured prominently in presidential speculation. Many vice presidential candidates have been prior vice presidential shortlisters; that group would include at least Humphrey, Shriver, Mondale, Bush, Bentsen, Gore, Kemp, and Edwards. Nonetheless, most vice presidential candidates are able and accomplished public figures. Many have been among the leading political figures of the last half century or so. Since 1960, 16 of the 22 first-time running mates had served at least 10 years in traditional vice presidential feeder positions when chosen. The list of those who had not (Agnew, Eagleton, Shriver, Ferraro, Edwards, Palin) included some formidable figures. Eagleton’s Senate career was sufficiently admired that he, along with Howard Baker, was chosen to speak when the Senate celebrated its bicentennial. Shriver had held appointive office under three presidents. Most presidential candidates now understand the political wisdom of choosing a running mate who is a plausible president. Although competency now assumes greater importance than once was the case, vice presidential choice depends on the identity of the presidential nominee. Presidential nominees assess their needs differently and elect to send different signals through their choice. Those without long association with Washington, DC, choose Beltway insiders. Five of the last six presidents (all but George H.W. Bush), having spent little time in Washington, chose running mates with long experience in national government. Although an occasional insider nominee chooses an outsider running mate (Nixon-Agnew, McCain-Palin), most also select running mates with strong DC credentials. Tickets rarely span a party’s ideological space anymore but some philosophical diversity is common; think Jimmy Carter and Mondale, Ronald Reagan and Bush, Bush and Quayle, Michael Dukakis and Bentsen, Romney and Ryan. Recent Republican presidential nominees other than Reagan have chosen a running mate to their right. Most tickets have some geographic balance. The Clinton-Gore model was a smashing electoral success in its context but remains something of an anomaly. Recent nominees may covet the big blocs of electoral votes in contested states but they rarely choose a running mate to carry a large, swing state. The right candidate has to be available to justify that approach. Notably, some recent vice presidential candidates have come from small, safe states like Alaska, Delaware, and Wyoming. The oldest candidates generally choose a middle-age (Reagan-Bush, Dole-Kemp) or young (Bush-Quayle, McCain-Palin, Romney-Ryan) running mate rather than a fellow Social Security eligible. Young nominees sometimes reinforce youth (Clinton-Gore) but sometimes reach for gravitas (Obama-Biden). Some value compatibility more than others but most prefer a circumspect, disciplined running mate to a loose cannon. So what does all of this herald for 2016? Few, if any, recent vice presidential selections were predicted the January before the election, and this year’s choices are probably even less apparent than normal at this point. The crystal ball won’t even begin to defog until sometime after a presidential nominee emerges on the Republican side and the context clarifies in both parties. The probability that Hillary Clinton will be the Democratic nominee gives some definition to the Democratic choice, although the uncertain context makes many judgments speculative. It seems inconceivable that she would give serious consideration to Bernie Sanders as her running mate; his age and ideological position make him an unlikely running mate. Nor would Martin O’Malley seem a likely shortlister unless his campaign performance and standing improve dramatically. The Democratic Party has a number of talented women officeholders, yet the first woman presidential nominee seems unlikely to choose a woman running mate. More likely Clinton would consider some of those who Kerry and Obama vetted, like Sen. Tim Kaine (D-VA), former Sen. Evan Bayh (D-IN), and Secretary of Agriculture Tom Vilsack (D-IA), as well as Sen. Mark Warner (D-VA), Sen. Sherrod Brown (D-OH), Secretary of Housing and Urban Development Julian Castro (D-TX), former senator and Secretary of the Interior Ken Salazar (D-CO), and former Gov. Deval Patrick (D-MA), among others. The chaotic and unprecedented nature of the Republican presidential race makes consideration of the second spot far more uncertain. It is impossible to identify a running mate for an unknown selector. Moreover, the somewhat unprecedented nature of the GOP race raises the possibility that conventional patterns would be ignored. Would a neophyte like Donald Trump, Ben Carson, Carly Fiorina, or even Ted Cruz feel compelled to choose a more conventional running mate with some gravitas, or would they be inclined to double-down to emphasize their brand? Would a more conventional nominee like Jeb Bush, John Kasich, Chris Christie, or Marco Rubio feel compelled to select an outsider to placate the Republican base? The caution that an unsuccessful presidential candidacy is generally not the route to the ticket’s second spot would seem to apply even more forcefully this year. Most of the Republican presidential candidates are not plausible vice presidential candidates. Trump, Carson, and Fiorina have never held public office, and Trump, Carson, Cruz, Rand Paul, Christie, Bush, or Mike Huckabee would not seem ideal partners to most presidential nominees based on their temperaments, positions, or known baggage. Based on conventional criteria, Rubio or Kasich would seem the most likely vice presidential candidates from the presidential candidates, subject, of course, to how their campaigns go. Govs. Nikki Haley (R-SC) and Mike Pence (R-IN), as well as Sen. John Thune (R-SD), are among those who might also receive consideration, but that list will surely lengthen as the presidential nominee and context clarify. Some possibilities, in both parties, might be eliminated by the vetting process or by their own choice. For instance, Gov. Brian Sandoval (R-NV) is frequently mentioned as one of the party’s most gifted officeholders. But his pro-choice position on abortion rights could spur too much grumbling amongst the party base. Vice presidential choice 2016 remains one of the greatest mysteries of political life, at least as the election year dawns. Joel K. Goldstein is the Vincent C. Immel Professor of Law at Saint Louis University School of Law and is one of the nation’s foremost experts on the vice presidency. 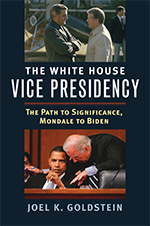 His latest book, The White House Vice Presidency: The Path to Significance, Mondale to Biden, is on the growing power and stature of vice presidents. It will be released by the University Press of Kansas in March.